A woman arranges greenery Thursday in a planter on Main Street in the village of Northeast Harbor. Even though the Mount Desert Island village has struggled economically to maintain its year-round character, town officials this week voted not to allow cruise ships to offload passengers at the local marina. The sun sets over Northeast Harbor late Thursday afternoon. 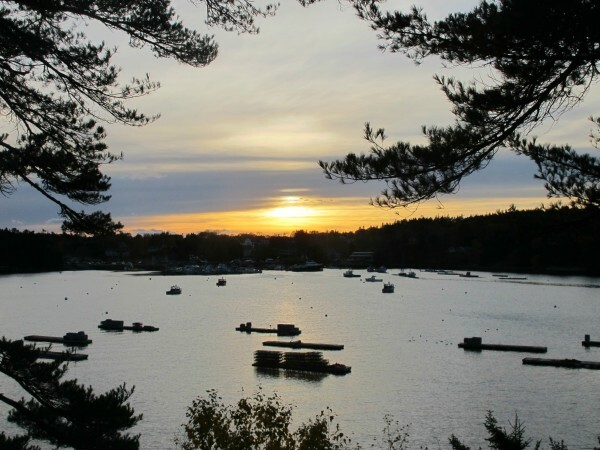 The harbor's mooring field, which is crowded from late spring through early fall, is sparsely occupied in the colder months, reflecting the village's increasing seasonality. MOUNT DESERT, Maine — When the Pearl Mist dropped anchor at the mouth of Northeast Harbor in September and brought its affluent passengers ashore, some local merchants thought their ship had come in. Local lobstermen and others interpreted the event differently, however, and viewed the 200-passenger cruise ship more as a bull in a china shop than a windfall. Since then, the ensuing debate has escalated beyond whether more small cruise ships should be permitted to bring passengers ashore in this Mount Desert Island village. It has morphed into a full-blown community conversation about the village’s economic decline over the years and what its future may hold. Unlike a dozen other cities and towns spread along the Maine coast, where attracting cruise ship visits has been a key economic development strategy, local officials have rejected the idea. “I don’t think cruise ships are right for here,” resident Story Litchfield told the town’s board of selectmen on Nov. 7 in the local elementary school gymnasium. Most of a crowd of approximately 120 people applauded in agreement as she addressed the board. After about two hours of debate, selectmen voted 5-0 against allowing American Cruise Lines to discharge passengers at the local marina next summer. An executive with the company, Vice President Paul Taiclet, was at the meeting but declined to comment after the vote. Most coastal Maine communities see the vessels — both the enormous ones commonly seen in Bar Harbor and Portland and the smaller versions operated by American Cruise Lines — as a boon. With $5 billion in revenues in Maine last year, tourism is by far the biggest industry in Maine, and cruise ships have been viewed as a way to draw more tourist spending to Maine without adding to the crush of cars that can choke local roads in the summer. Bar Harbor, which abuts Mount Desert and is the state’s busiest cruise ship port, this year had 105 cruise ship visits that brought an estimated 158,000 passengers into Frenchman Bay. Portland, the state’s second busiest cruise stop, hosted more than 70 ship visits this year and, for the first time, more than 100,000 total passengers. Bob Leeman, marketing manager for Cruise Portland, said recently that the growth in cruise ship visitation to Portland has had substantial economic impact on Maine’s largest city. 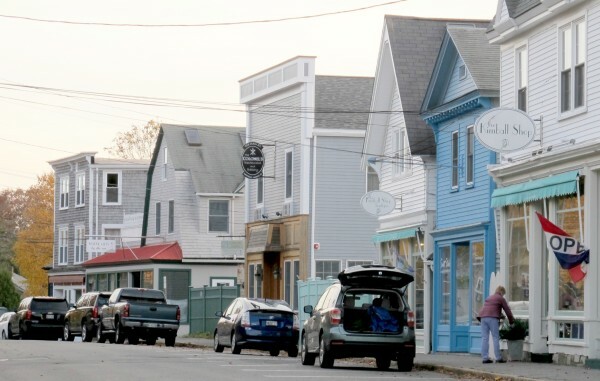 In Northeast Harbor, the largest village in the town of Mount Desert, residents have faced an uphill battle in maintaining its year-round character — a struggle not unusual in coastal towns where wealthy summer residents pay top dollar to own houses on or near the ocean. Northeast Harbor has an elementary school and a new library that opened in 2007, but many year-round residents with comparatively low incomes have sold their homes at good prices and moved two or three towns away, where housing costs and property taxes are lower. The decrease of year-round residents, combined with other factors such as competition from online retailers and national big-box chains, makes it hard for local stores to stay open through winter, when many local houses are shuttered and dark. Compounding the village’s deserted feeling in the cold months are vacant lots on Main Street, where fires destroyed a total of four commercial buildings in 2008 and 2009. Only one of those businesses, The Colonel’s Deli, has been rebuilt. The income local businesses would get from cruise ship passengers is a good reason to allow American Cruise Lines to bring passengers ashore at the local marina, some local residents insist. Erin Gray, co-owner of the Pine Tree Market, said that the day the Pearl Mist was in town, her store had $3,500 in revenues, far more than its $2,000 daily average for that time of year. She said the grocery store manages fine in the height of summer, when tourists and seasonal residents are around, but keeping the business going through the winter is a challenge. “We were pleasantly surprised at the size of the [revenue] boost” from Pearl Mist’s visit, Gray said Wednesday. She said the store loses money from November through April each year but that she and her husband keep it open because it serves as a community focal point. The selectmen’s vote, she said, makes that financial sacrifice feel less appreciated. “This may be the last straw for us in terms of closing the Pine Tree for winter,” Erin Gray said. People opposed to drawing cruise ship traffic to Northeast Harbor have expressed sympathy for the Grays’ situation but say cruise ships will not help preserve the village’s small-town character. Twenty local property owners weighed in on the issue in an open letter to the town that was published Nov. 3 in the Mount Desert Islander weekly newspaper. The letter said cruise ships “would jeopardize the unique character” of Northeast Harbor and harm the income of local lobstermen, who would lose gear by having the ships plow over their buoys and breaking lines or dragging traps along the bottom. The letter also announced the creation of a not-for-profit entity called the Mount Desert Economic Sustainability Initiative, the purpose of which includes developing affordable housing and mortgage assistance programs, and stimulating economic opportunities in the central Northeast Harbor village, among other things. Among the people who signed the letter — and hundreds more whose names appear on the group’s website — are billionaire summer residents David Rockefeller Jr. and brothers Mitchell Rales and Steven Rales. Attempts this week following the Nov. 7 selectmen’s meeting to contact the group’s organizers were unsuccessful. Bob Pyle, a former local librarian who opposes bringing regular cruise ship visits to Northeast Harbor, highlighted just how much the village’s year-round character has diminished over the decades. At the selectmen’s meeting, he brandished a list of businesses Northeast Harbor had in 1963, when he conducted an informal survey of their names and locations. Among them were a movie theater, a shoe repair shop, more than one pharmacy, a fish market, a bookstore and several food markets — all of which, except the Pine Tree, since have disappeared and not been replaced.